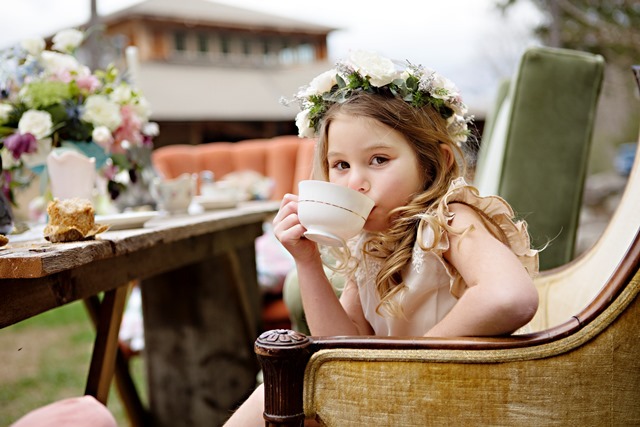 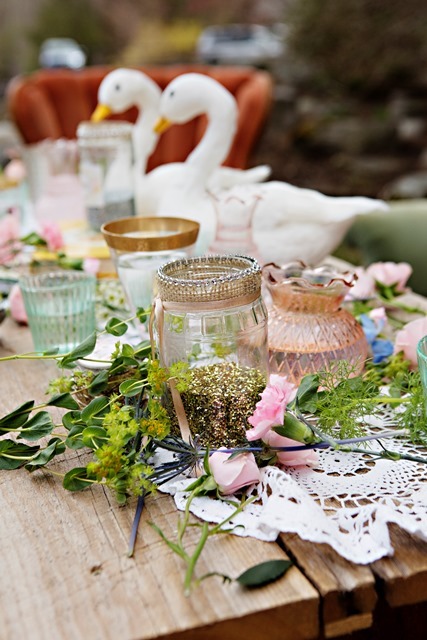 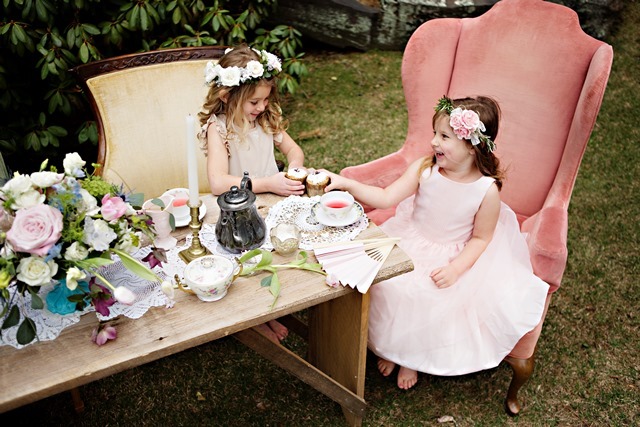 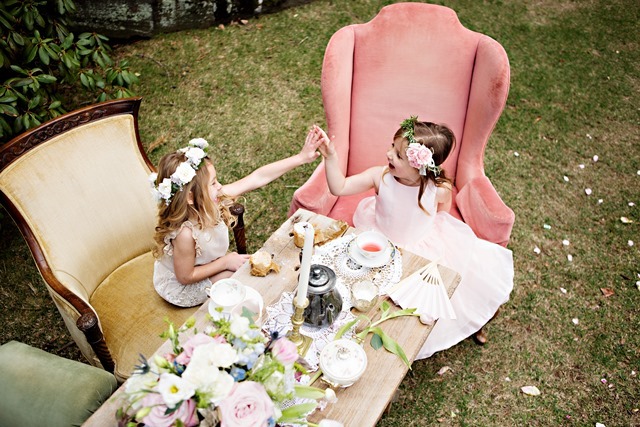 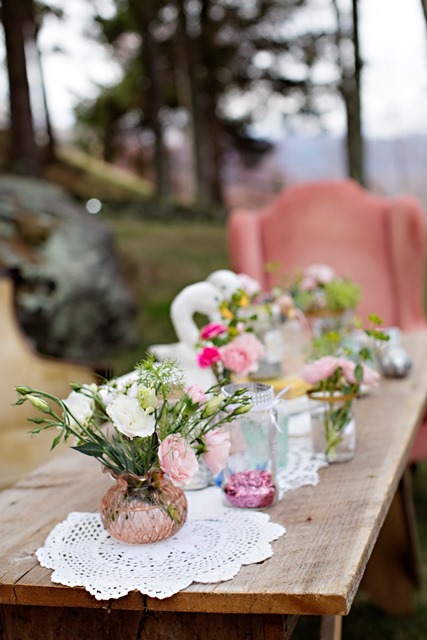 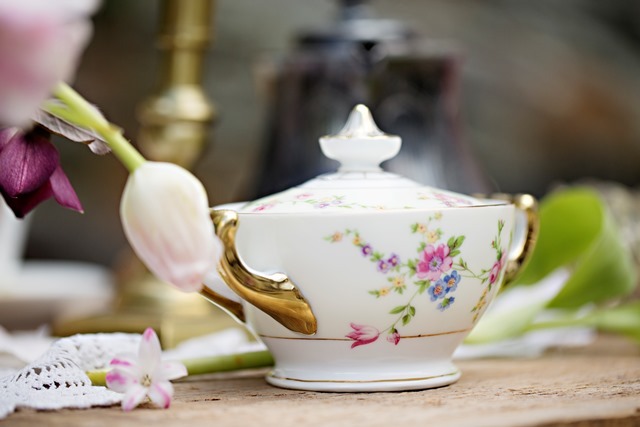 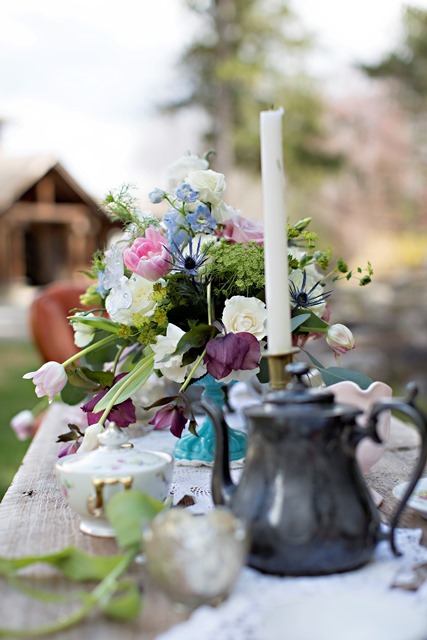 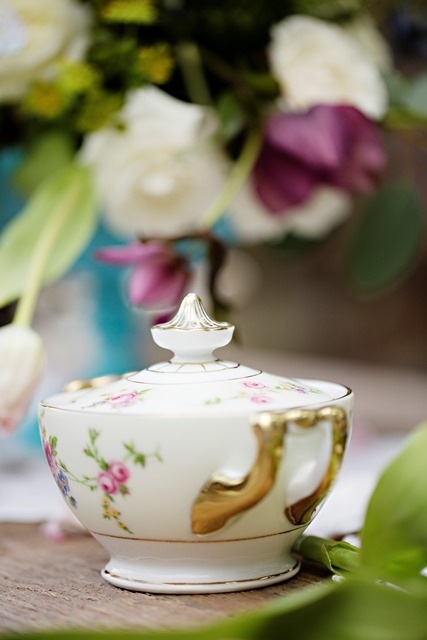 A Flower Fairy Tea Party in the Catskills! 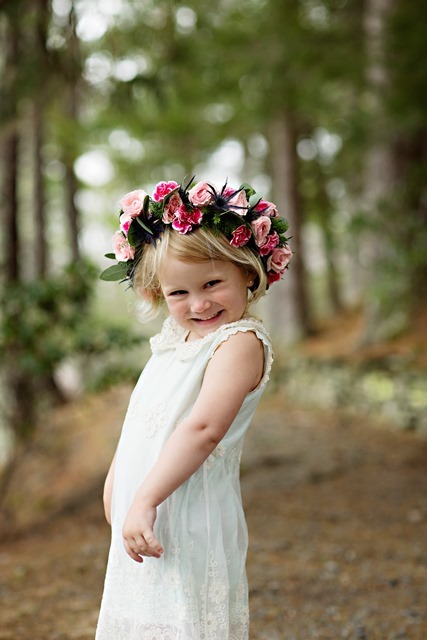 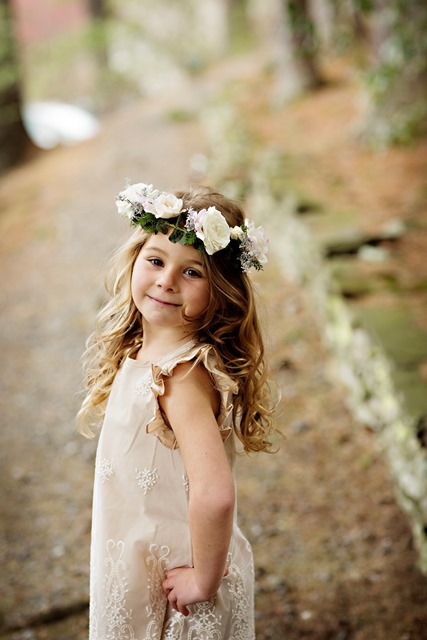 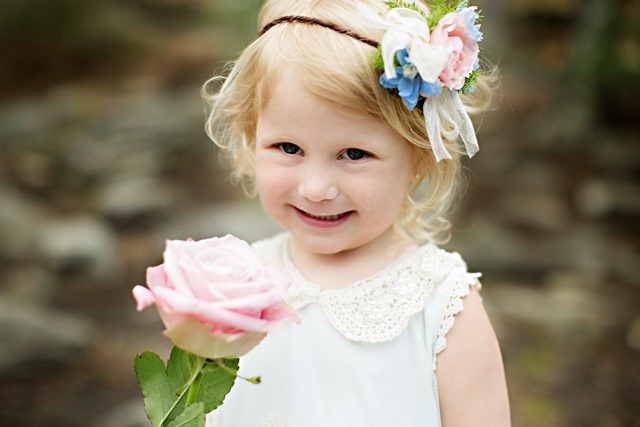 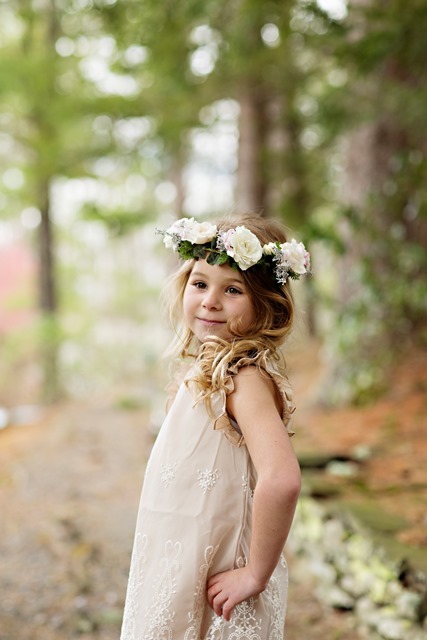 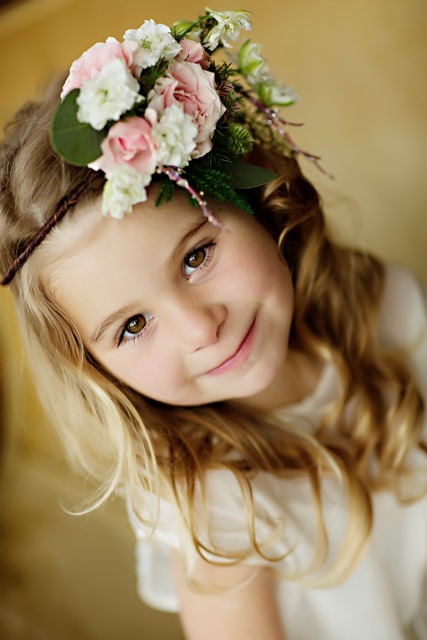 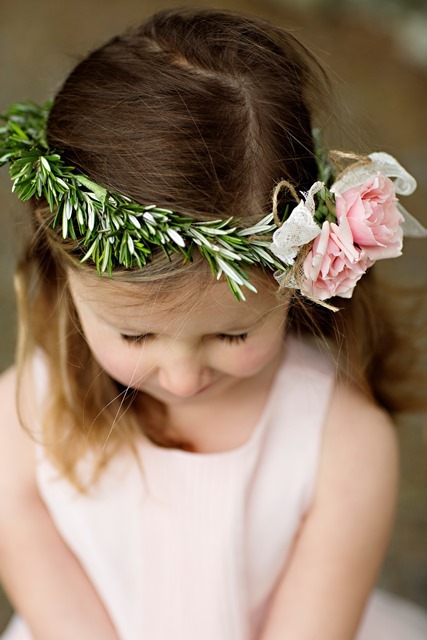 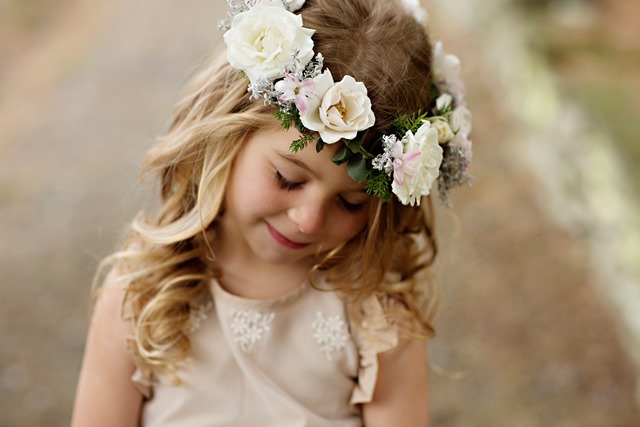 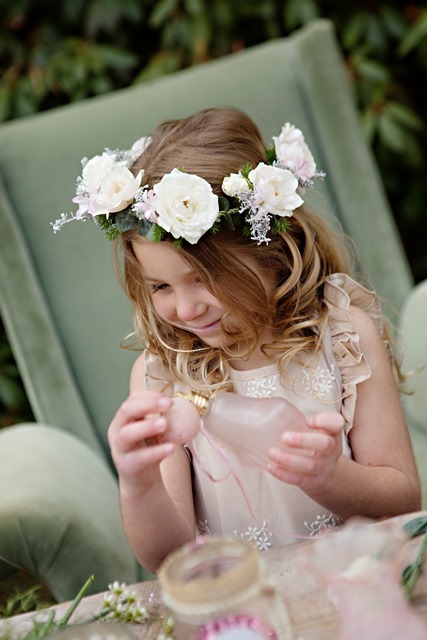 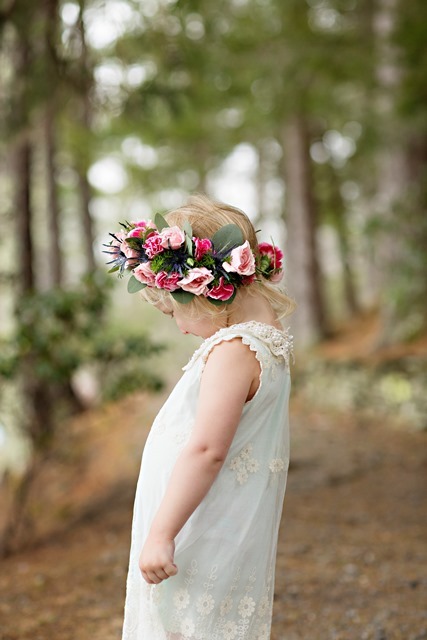 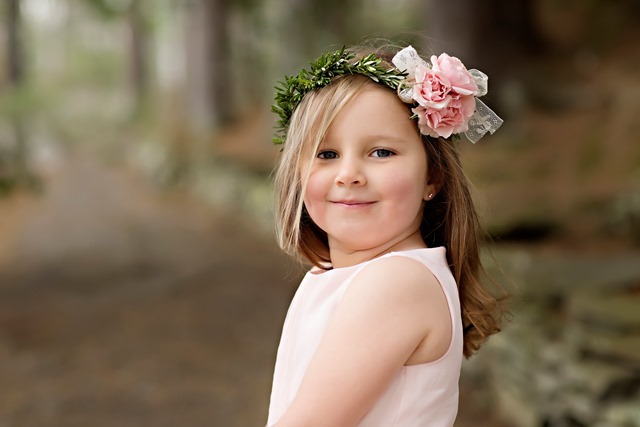 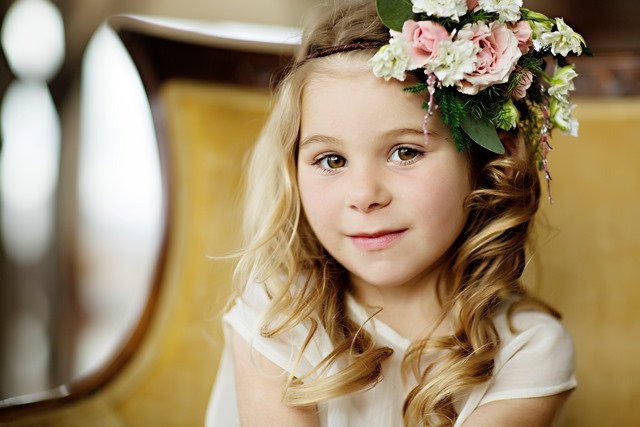 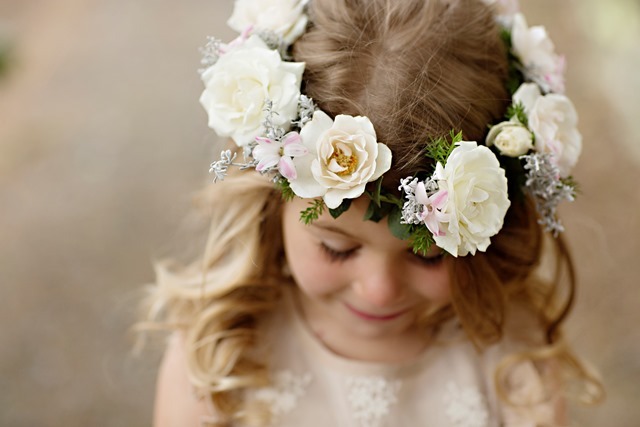 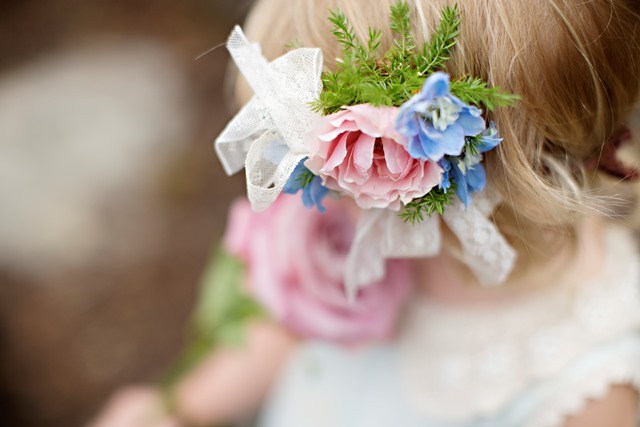 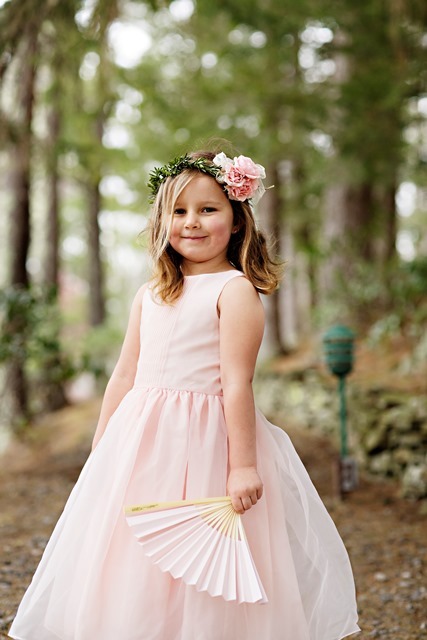 I have known Melissa Surprise for quite a few years now, and I don’t know of anyone better suited to do a children’s flower party photo shoot with! 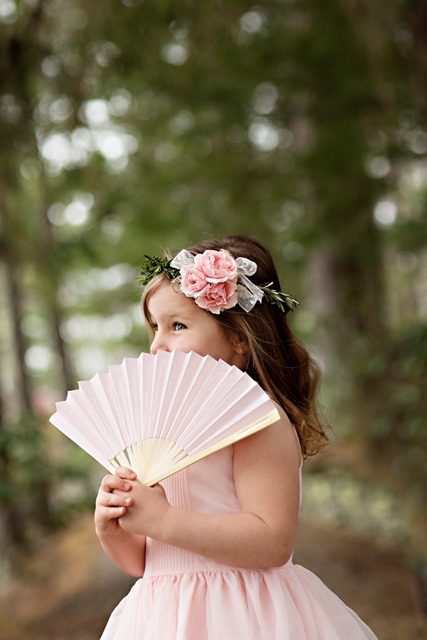 This talented photographer works with children and babies on a daily basis and I knew she would do a great job with this project! 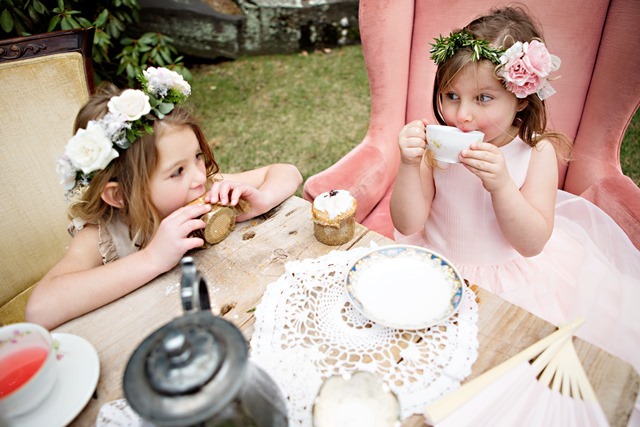 I have been hosting children’s parties for many years, but I rarely have a chance to take any photos of how truly charming and adorable they are! 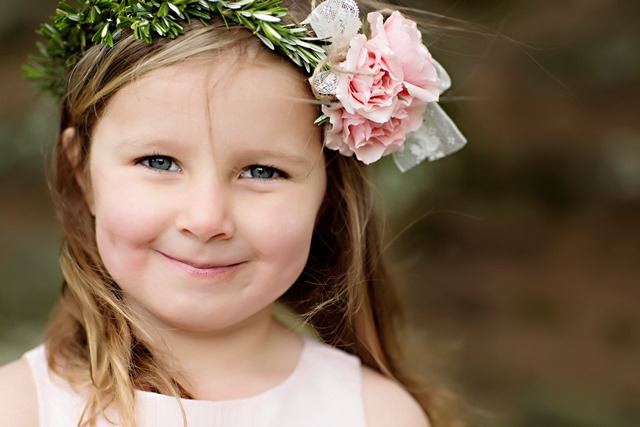 So with the help of my 4 year old, Violet, who adores dressing up and tea parties, we made some flower halos and got to work! 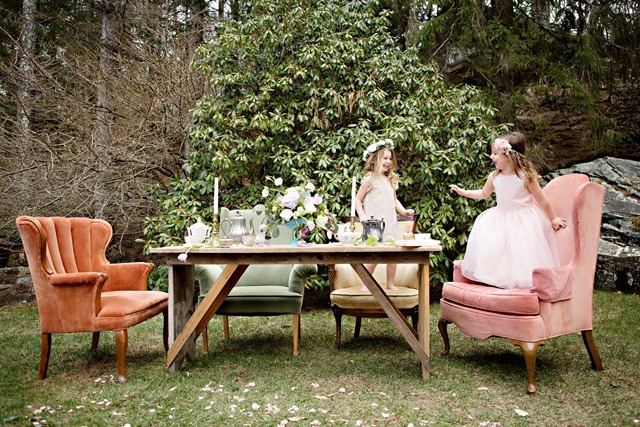 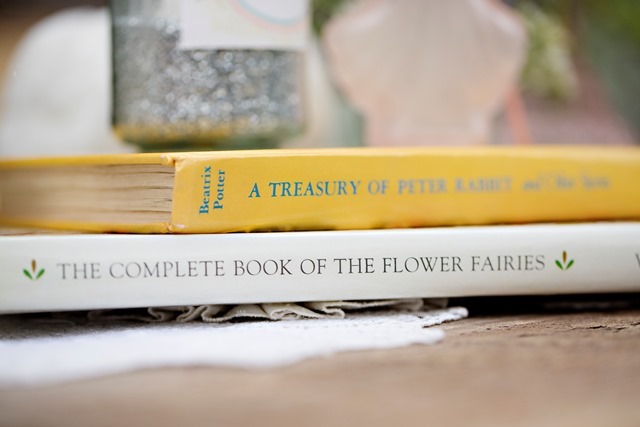 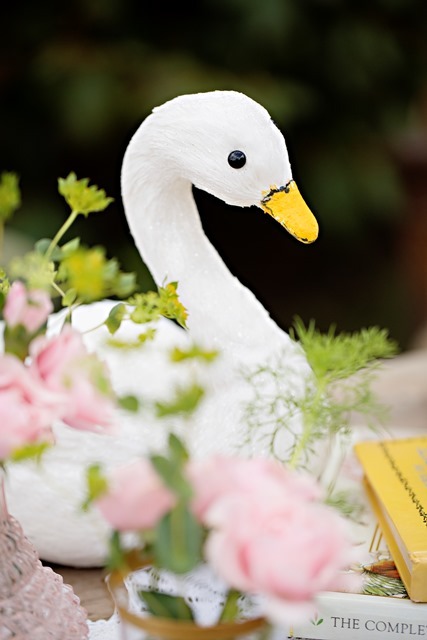 We gathered up some of our favorite rental pieces, including antique velvet chairs, fairytale books, glitter swans, and as many pretty blooms as we could carry. 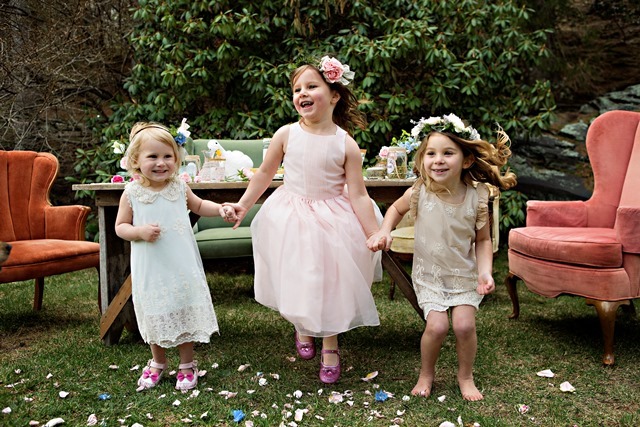 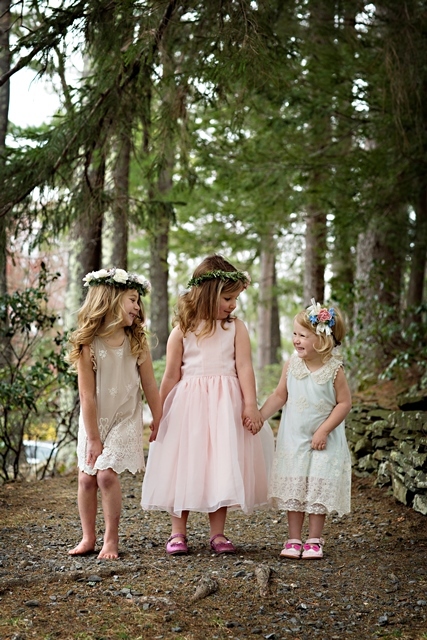 We brought all of this up to Onteora Mountain House because we needed a wooded, but not super wild area to photograph these little flower girls in. 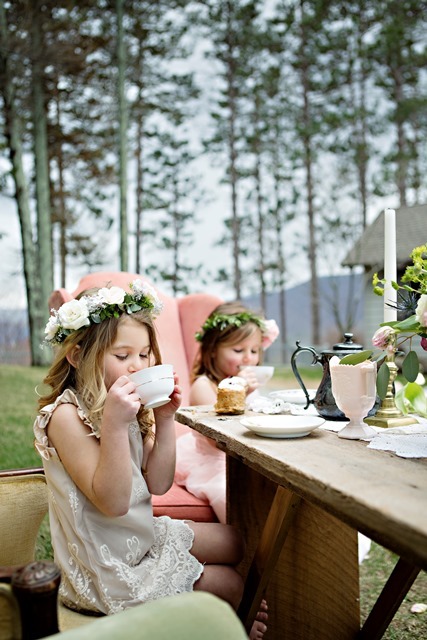 What better place than this!? 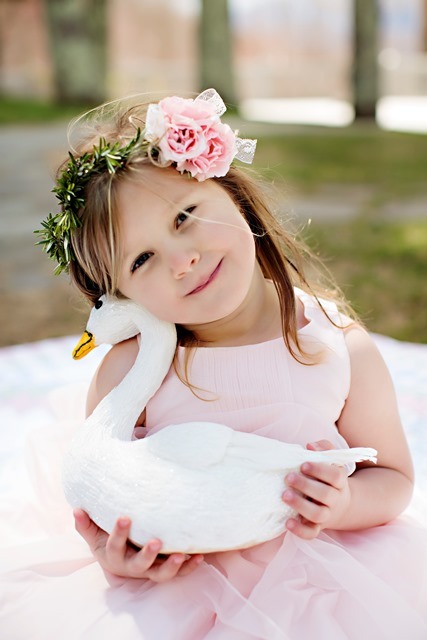 Melissa brought along two more little darlings, who were very cooperative, considering they had probably never participated in such a photo shoot! 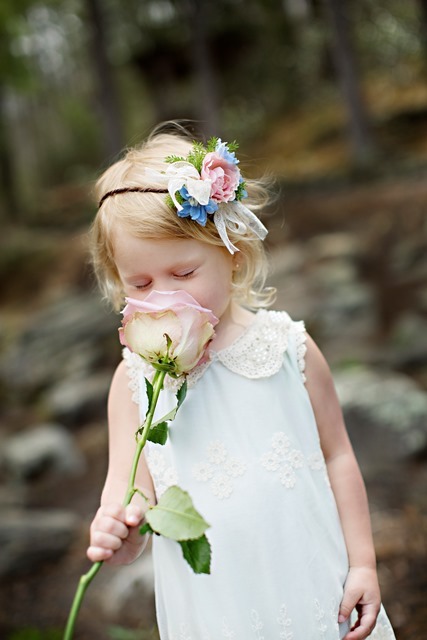 To Violet, this was an everyday occurrence, since she literally grew up in a flower shop! 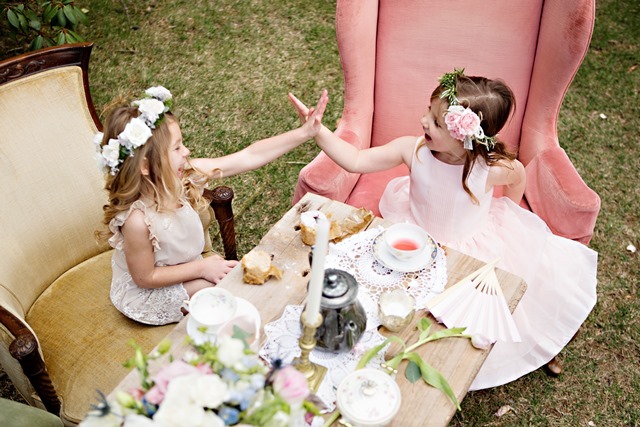 If you are interested in hosting your own Flower Fairy Party, or any other children’s party, feel free to contact us for more information. 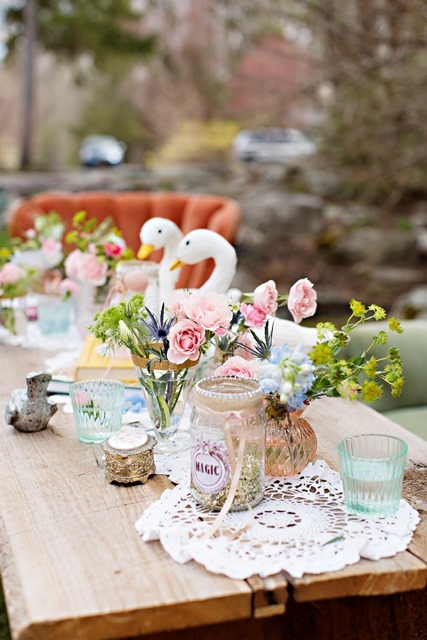 Each and every event is priced out a la carte, we do not have packages for these types of parties. 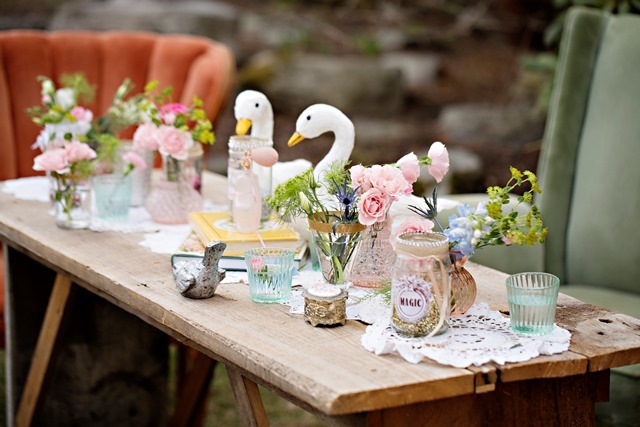 In the past we have created Dinosaur Terrariums, Thanksgiving Turkey Pomanders, and of course make your own floral designs types of parties. 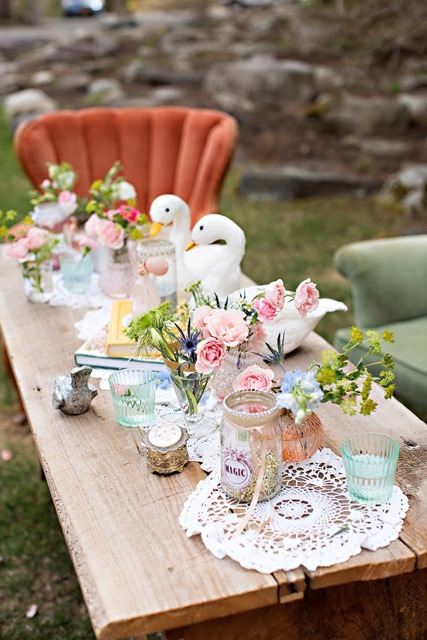 Looking back at these images, and seeing some of the more unusual requests we have had for photo ops this season, I could easily imagine creating a scene like this for a children’s activity at a wedding. 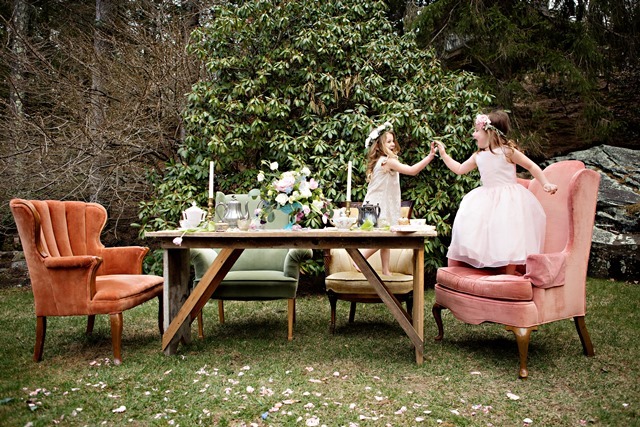 So the next time you are planning a children’s party or activity, give us a ring! 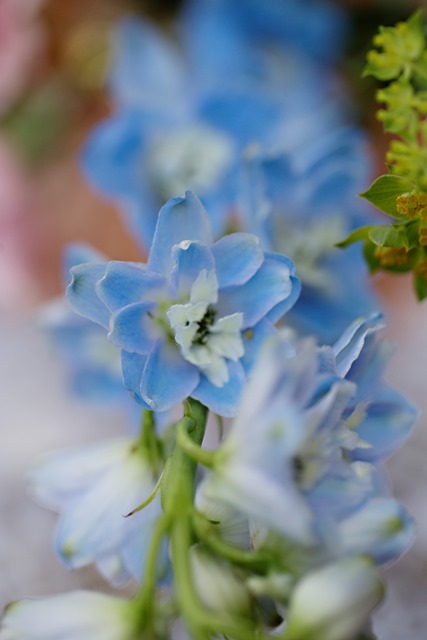 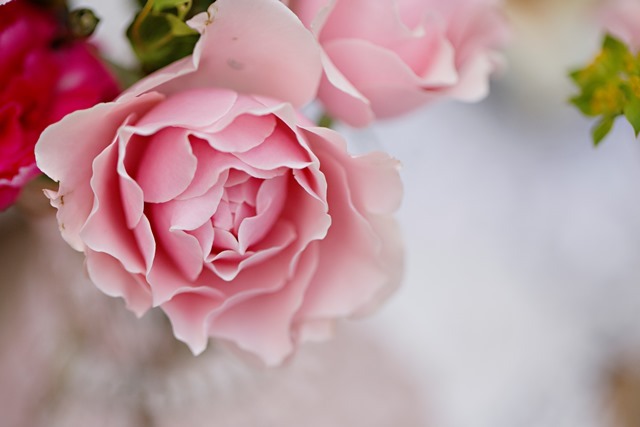 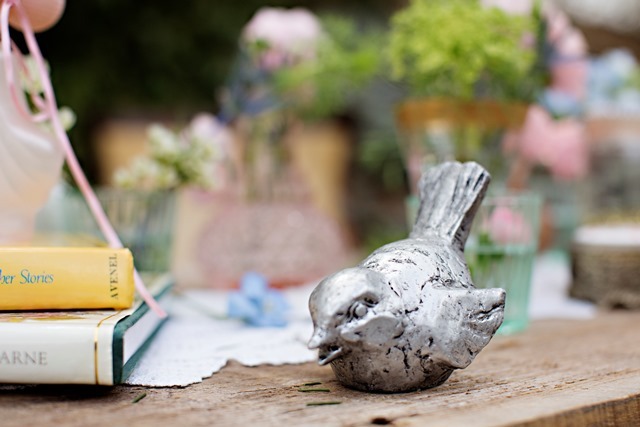 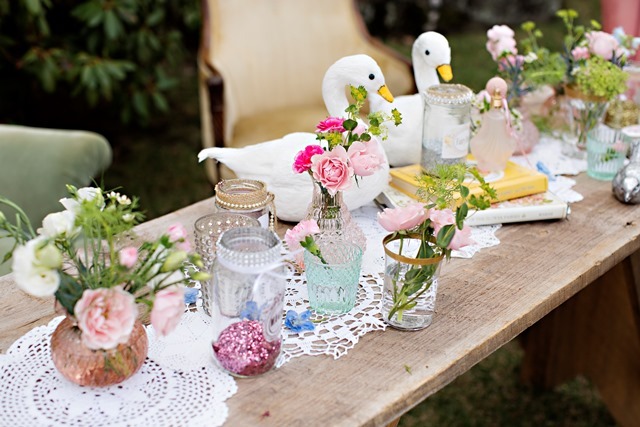 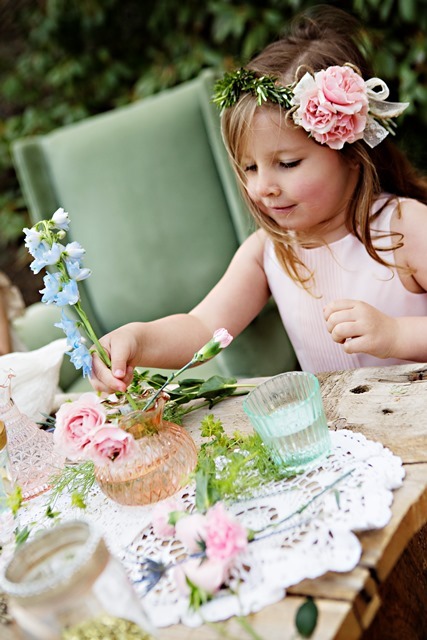 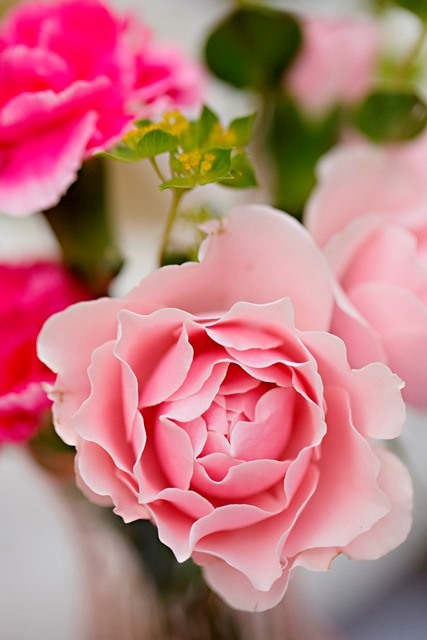 We’d love to play with some flowers with you and your little ones! 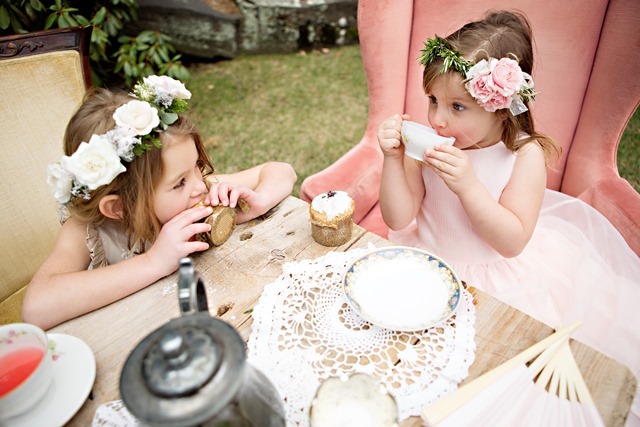 These cupcakes were a hit and even had dried flowers on them! 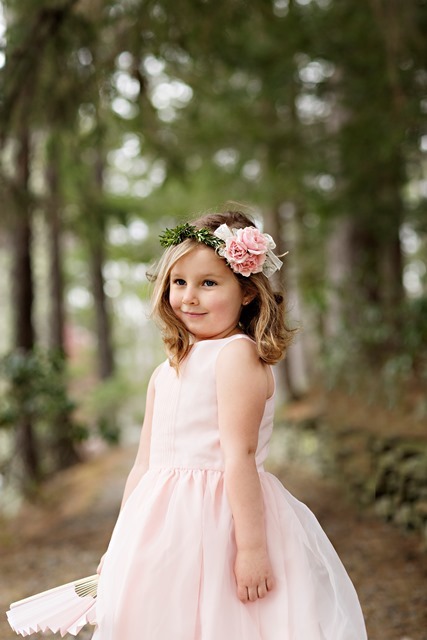 Thanks to Linda and the talented crew at Grounded! 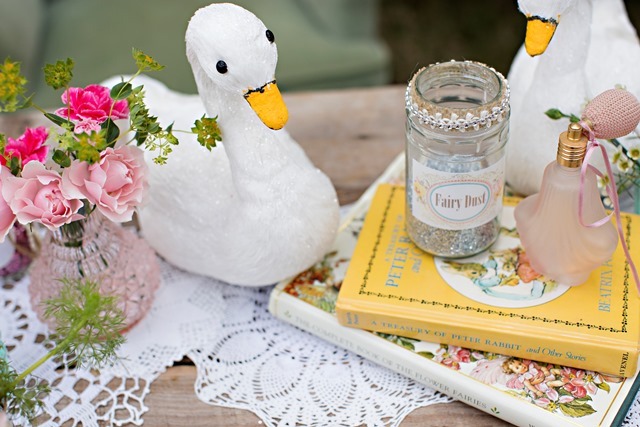 Oh glitter swans, how we love them! 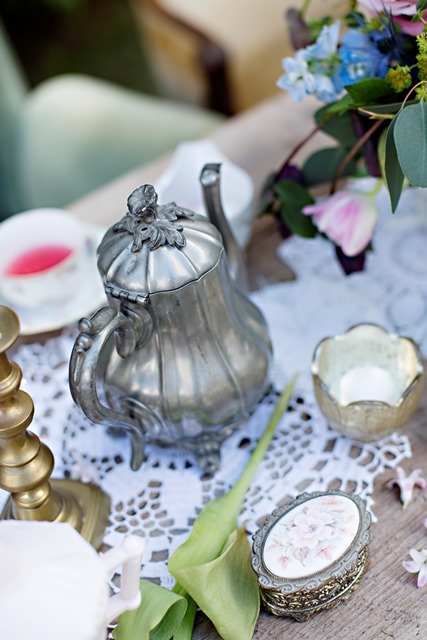 Our squash blossom teapot is always a hit for fall weddings! 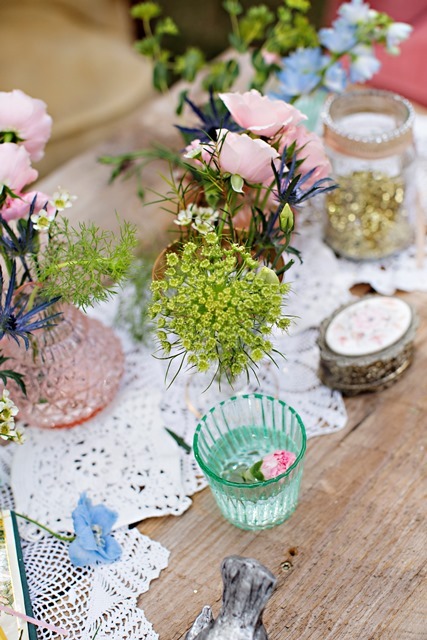 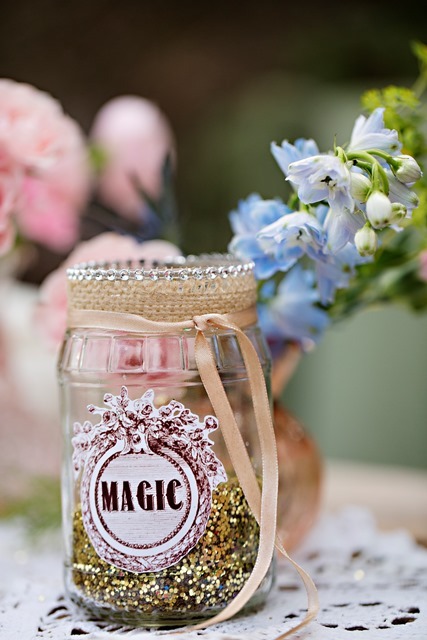 What is a flower fairy party without a little magic?